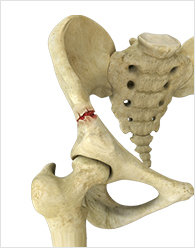 Hip arthroscopy is performed under general anesthesia. Your surgeon will make 2 or 3 small incisions about 1/4 inch in length around the hip joint. Through one of the incisions an arthroscope is inserted. Along with it, a sterile solution is pumped into the joint to expand the joint area and create room for the surgeon to work. The larger image on the television monitor allows the surgeon to visualize the joint directly to determine the extent of damage so that it can be surgically treated. Surgical instruments will be inserted through other tiny incisions to treat the problem. After the surgery, the incisions are closed and covered with a bandage.